Hey guys, As promised from my previous post, today i will be sharing my opinion on the new dark irregulars support and the new archetype that it just received. 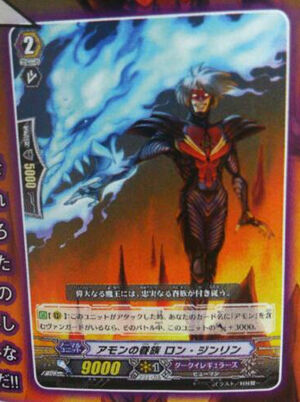 Dark irregulars have a new archetype called "Amon". Here is a flashback of who he is. He is dated back in BT03. Hmm who can not forget the infamous amon back then. 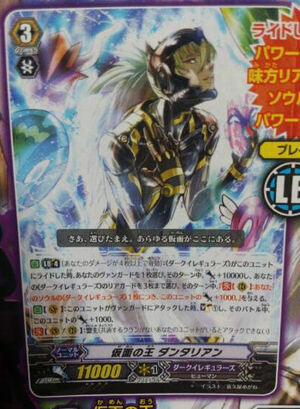 [CONT](VC):During your turn, this unit gets [Power]+1000 for each «Dark Irregulars» in your soul. 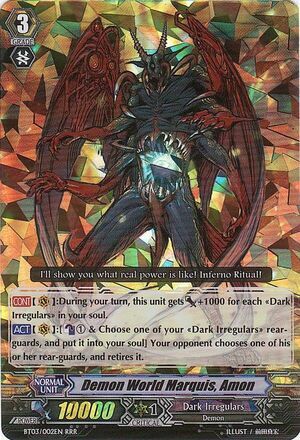 [ACT](VC): [Counter Blast (1) & Choose one of your «Dark Irregulars» rear-guards, and put it into your soul] Your opponent chooses one of his or her rear-guards, and retires it. Until now there is now news of amon being reprinted in the upcoming bt12. Hope he gets reprinted. To be honest amon can hit really high numbers gradually as its soul grows humongous and continuing eating up its rearguard. Amon is also a marquis which is one of the few nobles of the Demon World. Which means there is actually someone else who is greater than Amon and Amon is actually someone's subordinate. As for now lets look at amon's servants. 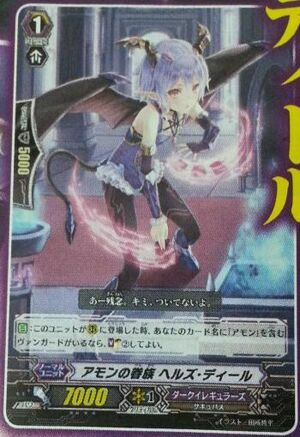 I kinda like the new art concept for dark irregulars as compared to the previous cards. 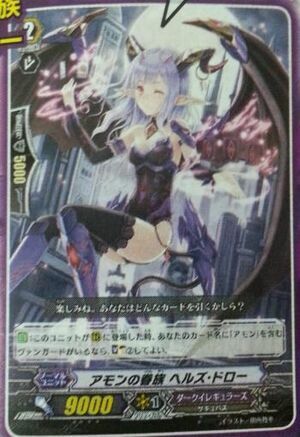 As for this... Would ya still wanna hunt for flirtatious succubus, when ya have this card to spoon feed your vanguard. 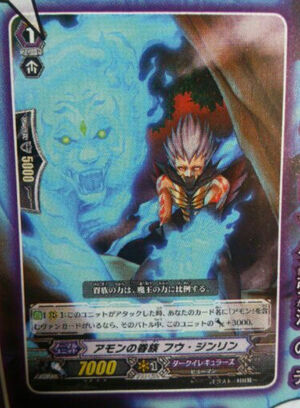 [AUTO]: When this unit is placed on (RC), if you have a vanguard with "Amon" in its card name, you may Soul Charge(2). Another staple that DI shood have. With 2 cards that help you soul charge, its far way consistent and easier to achieve a huge soul at a faster rate, which means hastened devastation for your opponent. 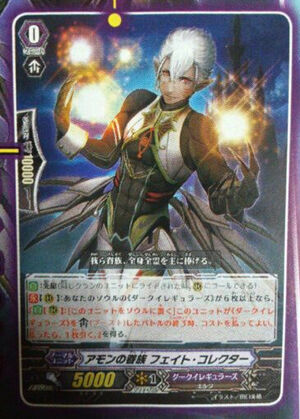 [AUTO](RC): When this unit attacks, if you have a vanguard with "Amon" in its card name, this unit gets [Power]+3000 until end of battle. No comments just another grade 2 that can hit a 11k base. Just another burning horn dragon clone and a staple. No comments just another grade 1 that can hit a 10k. Just another staple. 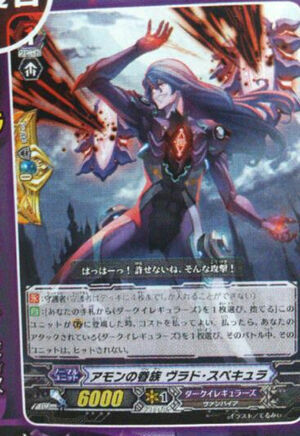 [CONT]: Sentinel (You may only have up to four cards with "[CONT]:Sentinel" in a deck) [AUTO]:[Choose a «Dark Irregulars» from your hand, and discard it] When this unit is placed on (GC), you may pay the cost. If you do, choose one of your «Dark Irregulars», and that unit cannot be hit until end of that battle. Finally, we got an awesome art for DI's Sentinel. I kinda liked the name and the art. Gotta comment that bushiroad are putting more effort into their card art as compared to season 1. 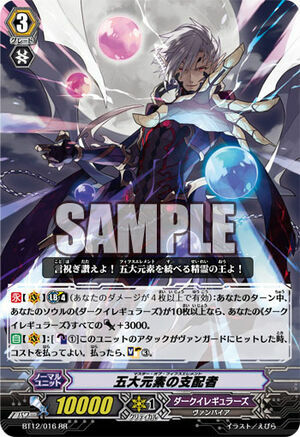 [AUTO]: Forerunner (When a unit of the same clan rides this unit, you may call this unit to (RC)) [CONT](RC):If the number of «Dark Irregulars» in your soul is six or more, this unit gets "[AUTO](RC):[Put this unit into your soul] At the beginning of the close step of the battle that this unit boosts a «Dark Irregulars», you may pay the cost. If you do, draw a card.". Besides all the amon support, here is some other support. Who needs A gancelot when ya got dantalian to turn 3 of your rearguards into a mini Amon that enables self charging every turn. [CONT](VC) Limit Break 4 (This ability is active if you have four or more damage):During your turn, if the number of «Dark Irregulars» in your soul is ten or more, all of your «Dark Irregulars» get [Power]+3000. [AUTO](VC):[Counter Blast (1)] When this unit's attack hits a vanguard, you may pay the cost. If you do, Soul Charge (3). Thats it for now... I know this is an overdued post. however its never too late to study these cards that are gonna be released.